Gallo-Roman milestone (MC) on the Helvien way (the Antonin Piles way), dating back to 306-307. A panel translates the inscription. Church founded in the middle of the 14th century in the municipality of La Souche, in the Ardèche canton of Thueyts. It was entirely rebuilt at the end of the 19th century. Burzet’s calvary is part of the unique 32 stations in Europe from the 18th century. Each Holy Friday, more than 60 “burzetins” (people from burzet) offer a disguised reconstitution of the Christ Passion along the cross walk. The chapel is located in “Old Mayres”. It faces the fortress and its chapel (St Médard) of the 17th century which belonged to the Montlaur and of which there remains only the ruins and is separated by the national road N102 from Aubenas to Puy en Velay. Small jewel of 12th century Romanesque art in the Salyndre river valley. The old town of Jaujac, on the hill over the left bank of the Lignon: twisting streets, old restored houses and a ruined tower. The castle was razed in the 16th century. The church dates from the 19th century. Its main door is remarkable. It was carved by an inhabitant of the village, Mr. DELUBAC. He also built a stations of the cross and the Christ over the altar. This medieval bridge spans the Lignon. Running down from the Tanargue highlands, the Lignon flows into the Ardèche upstream from Neyrac Les Bains. But before that, it has deeply carved its way through a splendid lava flow. This 18th century chapel is dedicated to Saint Bénézet, Burzétin shepherd who became famous for having built the Pont d’Avignon. La Souche is a typical village of the high Cevennes valley at the foot of the Tanargue massif. It is located upon the hill at 575m and its highest point is 1498 m.
The small church became a parish in 1869. The present church was built in 1871. It was entirely restored by Father Régis Moulin. The town of Lalevade of Ardeche is located along the right Ardeche riverside. Between Pont de Labeaume and the river Fontaulière and the river Salyndres. It is the smallest town in Ardeche with 227 hectares. Located in the heart of the National Park of “Monts d’Ardèche”, the village of Burzet (530m) is surrounded by natural sources, waterfalls and young volcanos. It is also known as a natural station labellised “Station verte” for its quality of living. Thueyts stands on a basalt platform above the Ardèche River with amazing views of listed sites such as the Echelle du Roi, Gueule d’Enfer and Chaussée des Géants. The current church of Jaujac was built in 1848-1852. It has basket-handle vaults, paintings in the choir, three gilded wooden statues and an organ with 23 instruments installed in 1970. There are many concerts in this church. 12th century bell tower, gargoyles, Gothic vaugnerite stone porch. Ventadour family emblems on the archivolts. 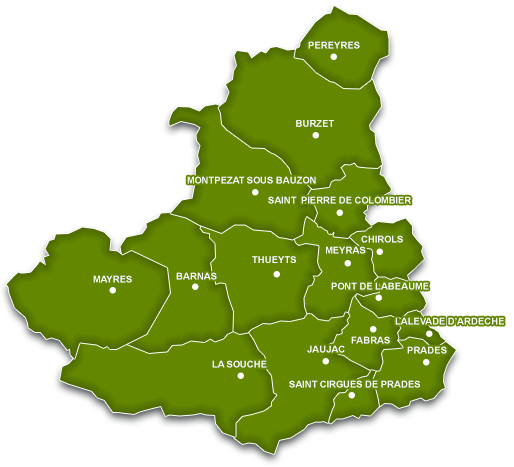 Part of the Casadéen network. The current church dates from the 19th century and is a collective work by everyone in the village. Have a stroll and gaze at 12 everyday scenes from the 20th century painted by artist Alain Royer in a village with personality (11 in the village and one at Neyrac Springs). The Tower of Chapdenac was formerly a watch tower and an advanced outpost of the Lords of the Ardèche valley. It dominates Sigadou. Private tower which cannot be visited. Surrounded by young volcanoes in the Cévennes, Meyras pays tribute to age-old crafts on its fresco trail…At every twist and turn you’ll see locals picking chestnuts, Saint-Blaise fair etc. Jaujac’s beautiful sites enthral visitors in amongst the Cévennes hothouses between the Ardèche’s youngest volcanoes and long basalt flows. Built in 1691 by Capuchin missionaries. Very impressive processions walked the route marked out by the 29 stations. This tradition was abandoned around 1920. “Faïsses” or terraces are vestiges of farming in bygone years. The word “Terrace” used to mean mud or cob walls. The oldest part dates from the 11th century. In the 16th century, it had 5 chapels. The Romanesque bell-tower was in fact only built in the 17th century. The solid wood statue of a black virgin can currently be seen in Pont-de-Labeaume Church. At the foot of the Vivarais’ last dormant volcano. Footpaths open all year to visit the volcano, dragonfly pond and local heritage. The Park Centre welcomes visitors in summer.